It came as a bit of a shock when my doctor and my cardiologist told me to stop drinking coffee, unless it was decaf. A morning pot of coffee to help me wake up has been a ritual for years. In the last two years I have taken to drinking my coffee black, with minimal sugar. What now? I have recently experimented with Laager "Rooibos Cappuccino", a mixture of Rooibos tea and frothy milk powder, that makes an enjoyable drink pretty close to instant Cappuccino, which is a special treat. 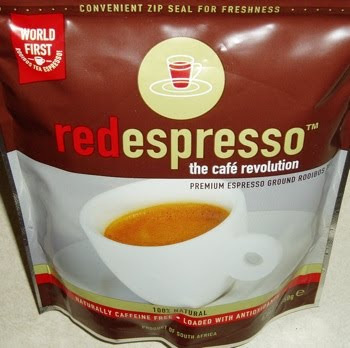 So when I visited my local supermarket, the packaging of Red Espresso caught my eye, and I decided to try it. It's refreshing, with or without milk. So now my morning pot of coffee has been replaced with a morning pot of Red Espresso. There is no caffeine at all, but plenty of anti-oxidants instead, which I'm told is good for me. If I get the urge for coffee, I can always have decaf, but I must say I'm enjoying the Red Espresso just as much. I found more information about it on the marTea site, and there is a web site where you can buy it in several countries. Even Amazon.com sells it. It is available at most supermarkets in South Africa and online from Pick 'n Pay. Update: It seems that their "patent" is one of those dodgy ones. See Noseweek #134, or check out a competing product at www.teaspresso.com. I can't understand how anyone would try to patent a natural product like tea.